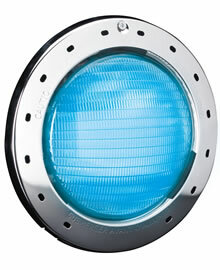 Jandy® Pro Series lights by Zodiac provide efficient pool illumination with no hassle. At Tropical Pools and Pavers, we pride ourselves in offering ONLY the best equipment available in the market today. That is the sole reason we install Jandy® Pro Series lights by Zodiac. WaterColors LED energy-efficient pool and spa lights provide the finest, brightest colors for your pool and spa with less than 50 watts of power. Utilizing Color Kenetics® technology, our LED lights saturate your pool and spa with three vibrant, primary colors; Cobalt Blue, Magenta, and Emerald Green, as well as six blended watercolors like Caribbean Blue and Violet. For a change of pace, choose from five color shows such as festive “Fat Tuesday” or “America the Beautiful”. Whether swimming or just lighting up the night, you’ll enjoy an endless display of brilliant, beautiful color. Create the dramatic splash you’relooking for with Jandy’s WaterColor LED lights. LED pool and spa lights offer vibrant lighting in nine brilliant colors and five festive color shows. Select one or transition through each for a color show sure to brighten your night. Add value and beauty to your backyard by extending your use into the evenings with JandyWhite lights. Nighttime is often the best time to enjoy your pool and spa. After a hectic day of modern life, relaxation is desired and an evening floating under the stars is the perfect prescription. Light your way to a warm body of water, safely entering your pool to float effortlessly under the evening sky. Discover the real benefits of an evening of spa therapy, melting the stress away, massaging sore muscles and aching joints. Tip your head back and become reacquainted with the peace and quiet of your backyard at night, under a celestial canopy, from the warm inviting glow of your pool or spa. JandyWhite Pool & Spa Lights bring a reassuring glow to any evening with vibrant, incandescent pool and spa lighting. A complete range of configurations assure the ideal lighting solution for your unique design. Brighten your backyard and highlight a spectacular evening of backyard entertaining with JandyWhite incandescent pool and spa lights.